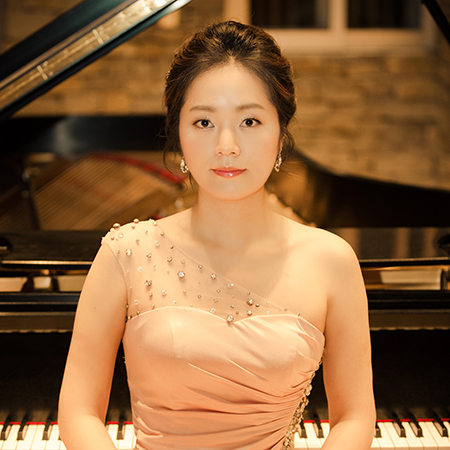 Korean born Canadian Pianist Rosa Hong holds a Bachelor of Music degree in piano performance from the University of British Columbia under the tutelage of Dr. Sara Davis Buechner, a Künstlerische Ausbildung degree (Masters of Music) with a perfect score at her entrance audition and a Solistische Ausbildung degree (Doctorate of Music in piano performance) from the Staatliche Hochschule für Musik Trossingen, where she studied with Prof. Tomislav Nedelkovic-Baynov and graduated with high honours. Her previous teachers include Hyekyung Ham, Edward J.Parker and Winfried Rompf. As a virtuoso soloist, Rosa Hong has performed across Canada and Europe, and made her solo debut recital at the Schloss Kirche in Bad Homburg, Germany in 2002, followed by solo recitals in Ravensburg, and Tübingen, Germany. Known for her sensitive sound and virtuoso technique, Rosa has appeared as soloist with the Vancouver Symphony Orchestra under the direction of Clyde Mitchell, Bramwell Tovey and Tania Miller, the White Rock Symphony Orchestra, the University of British Columbia Symphony Orchestra with Conductor Bruce Dunn, the Shumen Philharmonic Orchestra in Shumen, Bulgaria under the direction of Ivan Iliev and the orchestra ‘arcademia sinfonica’ under the direction of Dietrich Schöller-Manno in Trossingen, Germany. First prize winner in the 6th International six to eight hands piano competition in Marktoberdorf, Germany, with her Piano Trio, Rosa has also received Special Prize at the XIX Concurso Internacional de Piano de Ibiza, Spain, and numerous First prizes at Provincial and National Competitions such as the Canadian Music Competition, BC Provincial and National competitions. Through the years, Rosa has appeared in masterclasses with some of the most distinguished musicians such as Boris Berman, Ruth Laredo, Marc Durand, Lee Kum Sing, Krystof Jablonsky, David Dubal, David Moroz, John Perry, Jerome Lowenthal, Dr. Thomas Hecht, Mikhail Voskresensky and Professor Johann van Beek. While residing in Germany, not only as a solo concert pianist but also as a chamber musician, she gave several performances with the Vancouver Piano Ensemble and the Baynov Piano Ensemble both in Canada and in Germany. In 2008, Rosa performed with the Balingen Orchestra in a concert of 4 pianos with Orchestra with the Baynov Piano Ensemble, under the direction of Dietrich Schoeller-Manno, and appeared in many concerts with the Ensemble throughout the cities of Germany, including Tuttlingen, Besigheim, Villingen, Trossingen and Donaueschingen. Rosa is currently active as a concert pianist, lecturer in masterclasses in Germany and Canada, as well as adjudicator in music competitions and festivals.